How far would you go to protect your wine cellar? For Chateau Siran in Margaux this means building a nuclear bomb proof cellar. Watch our video tour with owner Edouard Miailhe. 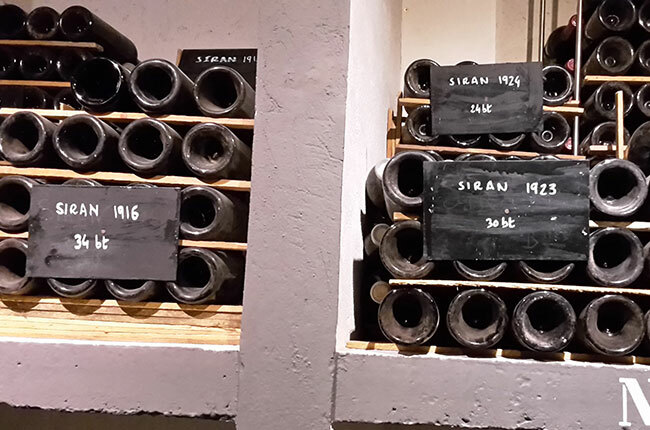 Chateau Siran’s nuclear bomb proof wine cellar was built in 1980 by Edouard’s father, who had wanted to safely store every vintage of Siran from the early 20th century. But why make it nuclear proof? ‘At the end of the 1970s, you had this nuclear power plant of Blayais that came to the other side of Pauillac, and then it also was the cold war. And then in Switzerland at the same time you had all those houses that had to be built with a bomb shelter in the house,’ said Edouard. The wines are stored in the basement, safely protected by a heavy nuclear proof door. The cellar holds every vintage from 1912. Edouard assures that the shelter is just for wines and not for people, housing every vintage of Siran from 1912 to 2013. ‘The two greatest vintages I’ve tasted were from 1947 and 1955…. You cannot imagine that they are as old as they are,’ said Edouard. That’s not the only piece of history at Chateau Siran, where there are also authentic Mediterranean amphorae which date back to 3rd century B.C. Whilst you may not have a nuclear proof wine cellar, make sure you’re storing your wine correctly with our video guide on storing wine at home.